Pastor Jeff & Pastor Tom want to thank and Praise the Lord for all the team effort to build God's Kingdom. 141 Salvations!! God is MORE than GOOD!! Praise His name!! After our largest first day of salvations yesterday it almost seemed slow today. 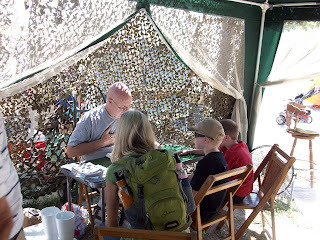 We had an average of about 10 salvations per hour for the first part of the day. The weather has been good - almost perfect. 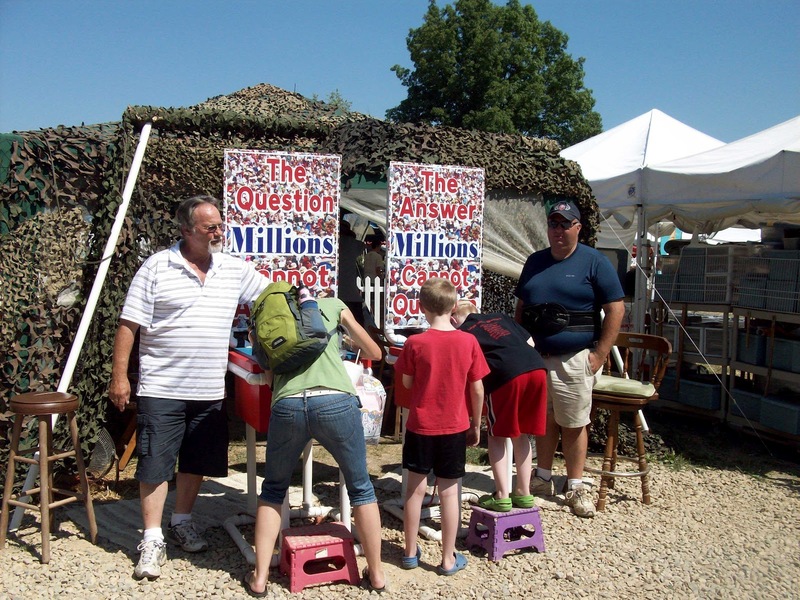 We are seeing many families come into the tent wanting to make sure they know the answer to the question. Workers from Central Baptist are excited about this ministry, we have another church observing hoping to start a box ministry of their own. Continue to pray - we are all very tired. It is probably a combination of the not only the labor - but the adrenaline rush when the tent is full of people praying and surrounded by the power of the Holy Spirit. Pray for Day 3. In His Service, Pastor Tom. 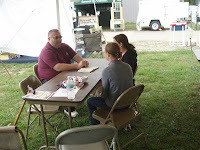 167 salvations for the first day at Isabella Co. Fair, in Mt. Pleasant, MI. Go God!! Go Team!! This is the largest number of salvations on the first day of a fair (typically lowest attended day). This tells us something - PEOPLE ARE PRAYING!!! Nothing powerful happens unless people are praying. Rev. 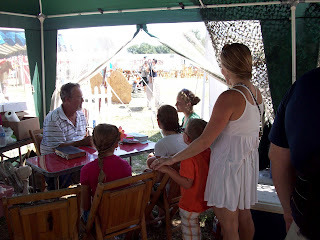 Bob Hollis leading a family to the Lord at Oakland Co. Fair. Rev. Bob Hollis made contact a few months ago with Central Baptist Church of Mt. 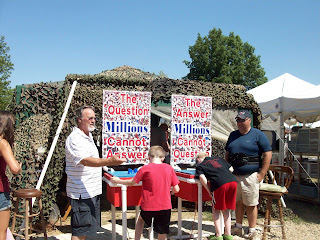 Pleasant (Pastors: Gordon Rydman and Allen Rydman) and got the ball rolling for Inside the Box to have a tent at the fair. 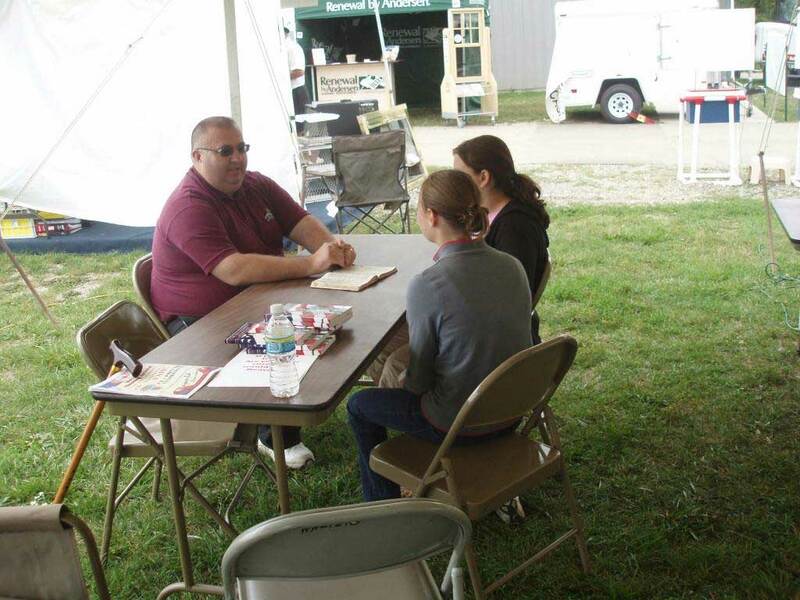 The church members and pastors have been praying since then and have been excited for the fair to start. Unfortunately the tent is in the worst possible location - but God is still working. 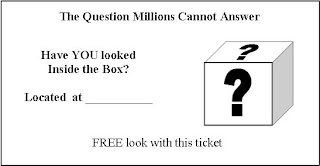 We have utilized some business cards (see picture) to invite people down to look 'inside the box.' Our workers walk the fair and hand out the 'tickets.' They are working to bring folks down to our location. Continue to PRAY. Today (Wednesday) looks like possible rain. Pray for the harvest and our workers' energy and enthusiasm. Pray also for those of us who are away from home for the week. And remember: God is good ALL the time. the lives of 551 people. None of the work done was about promoting any one church or ministry. It was about Souls-Souls-Souls. Pastor Tom Miller, First General Baptist of Waterford, Mi. for the workers and support from their respective churches. The folks from these churches are messengers of the Lord and diligently doing his work. We also had Bro. Bob Hollis of BEMA (Baptist Evangelistic Mission Assoc) and Rev. Russ Kidman, missionary to the military. We set up for the Farmington Hills Founder's Festival on Thursday morning, July 19th. The fair begins Thursday evening and runs through Saturday. 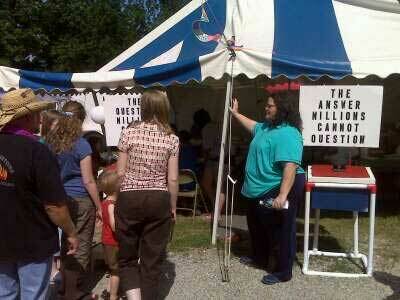 Pastor Darrin Lee's church, Cornerstone Baptist is hosting the tent. They had a wonderful first time turnout last year (2011) and saw 226 salvations for only a 2 1/2 day event. Pray that God will do even more this year. Pray for great weather and health for the workers. Bro. Bob Hollis leading a family to the Lord. Bro. Dana Babka leading a family to the Lord. Pastor Jeff and 'Paws' who knew the answer to the question! 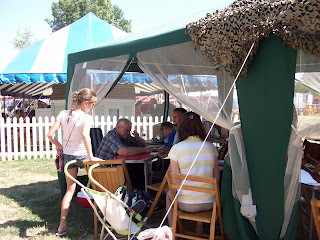 Thursday when I took my turn at the fair a group of 3 college age people, a young woman and 2 young men, came to my table in the tent. They were unchurched, 'sort of' knew about Jesus, but not much else. The young woman thought she would 'probably' go to heaven because she was baptized when she was a baby. I talked to them, beginning with original sin and the separation it created, how blood sacrifice was necessary before Jesus came, then how Jesus took our place, and John 14:6 - he is the ONLY way to heaven . One of them laughed nervously a few times. The young woman seemed sincerely interested, her eyes kept looking deep into mine. I felt that the young woman wanted to accept Jesus in her heart. I asked if I could pray with them. The young men shrugged. She nodded her head. Out loud I thanked God that they took the time to stop in. Then I said if you want to accept Jesus, repeat after me...and I began the sinner's prayer. I said, 'Dear Jesus,' None of them spoke. So I added, 'or say this in your heart,' and I finished the prayer. We ask each person to fill out a prayer card with at least their first name and any prayer requests. I also asked them to put a * by their name if they accepted Jesus. The young woman did!! The young men had gone silent, their smiles were gone. The young girl spoke softly and said, "I am so sorry." I thanked her and said, "it made me realize more deeply how urgent it is to share this message." Please think more about it," I said to the young men. They left the tent . 58 more salvations Sunday and Monday brings the total to 190 salvations for four days. There have also been many re-dedications. Several people who were saved previously by our ministry have stopped back by to talk and rededicate. THAT's EXCITING! It tells us that the Holy Spirit is at work in their lives and that our ministry IS making a difference for God's kingdom. Our traffic has been slower - possibly due to the extreme heat as well as 4 day extension with no large events scheduled until this week. But, God has been faithful. We have been handing out some 'tickets' (business size card) that say "Good for one FREE look in the box." This has been very successful when things are slow. We anticipate more traffic this week, especially on Thurs, Fri, and Saturday. Keep PRAYING as Satan has been active with many distractions. But we know we're doing a good work for the Lord when Satan is busy. The extreme heat seems to have dissipated, pray that the cooling continues. We have had a good amount of workers, but can use more as the week continues. Contact me or Pastor Jeff if you would like to participate at this fair. 62 saved and 5 rededications (see Pastor Tom's comments in Facebook Feed at right). Whooo-hoo! Go God - Go Team! It was just 1/2 a day yesterday, but even before the official opening 6 fair employees were saved. Our group arrived at 1:00 pm - not realizing the start time was 4:00 this year. But it was a GOD thing - had they not been there 6 people may not have been saved. AMAZING! What are your stories about Inside the Box? If you have participated in this ministry and there is a special story go to facebook and tell it. The story will also appear in the Facebook feed on this site. Late yesterday it was hard going to get people to look Inside the Box - they were just hot and not wanting to bother. The workers gathered in a circle to pray. Immediately after prayer they got the idea of handing out cold water if people would look in the box. They had 40+ salvations after that. Living water......? YOU'RE RIGHT! Pray today about the extreme heat and protection for the workers. We could use donations of water and ice. Call the churches or pastors to get in touch. If you have not already done so LIKE us on facebook and join this blog. Setup for the fair was done yesterday. 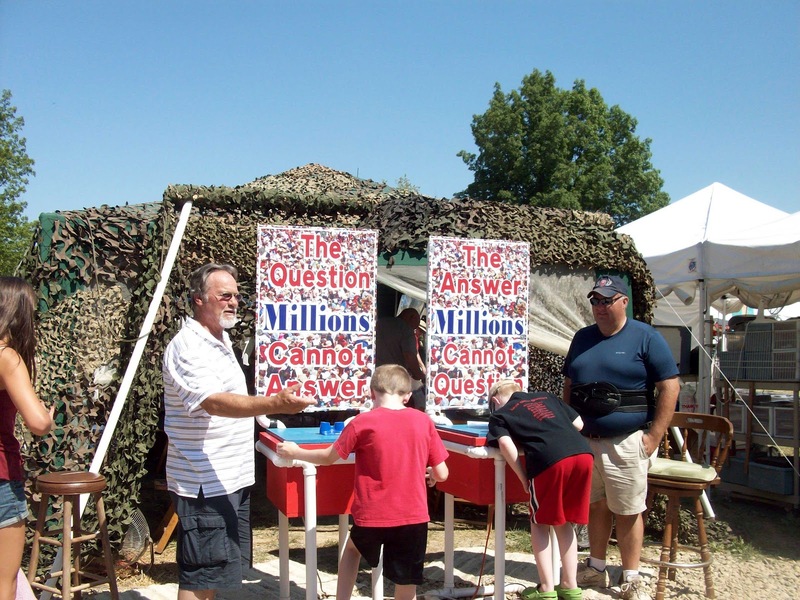 Tents, tables, chairs and question boxes delivered, unloaded, and set up in the 90* heat. Due to the storms there is no electricity on the fair grounds yet this morning. 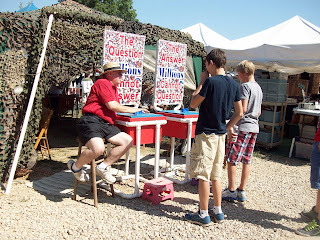 Pray that power will be restored as the question boxes operate on electricity. Also - the workers will need fans to help stay cool. 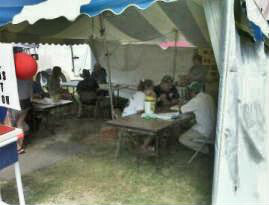 If you want to work in the tent contact either Pastor Tom or Pastor Jeff. If you want to help by donating bottled water or ice it would be greatly appreciated. In this heat they will need the extra water. Pray for their physical well being too. 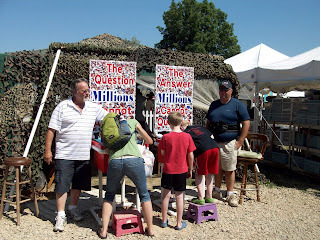 You can comment, keep updated and add prayers on Facebook at inside the box fair ministry. Fair season is upon us again! The Michigan Oakland County fair begins this week and runs for 10 days. We need your prayers! 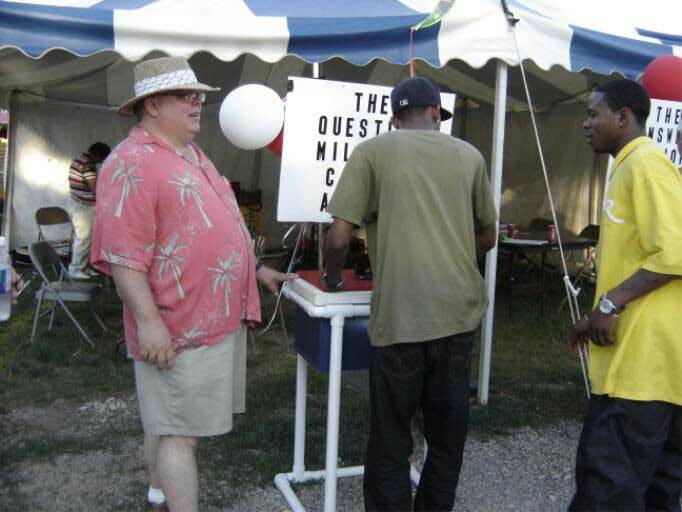 Inside the box Fair Ministry has been serving since 2008. In it's first summer of service God brought 527 to His salvation in less than one week! Glory Hallelujah! Could it truly be that simple, asking people if they want to go to heaven, then telling them the Gospel? The fact of the matter is most people don't know where they will go when they die. Yet, even in this day and age people are still desperate to find out how they can go to heaven. God has used this ministry to now reach thousands with the gospel. 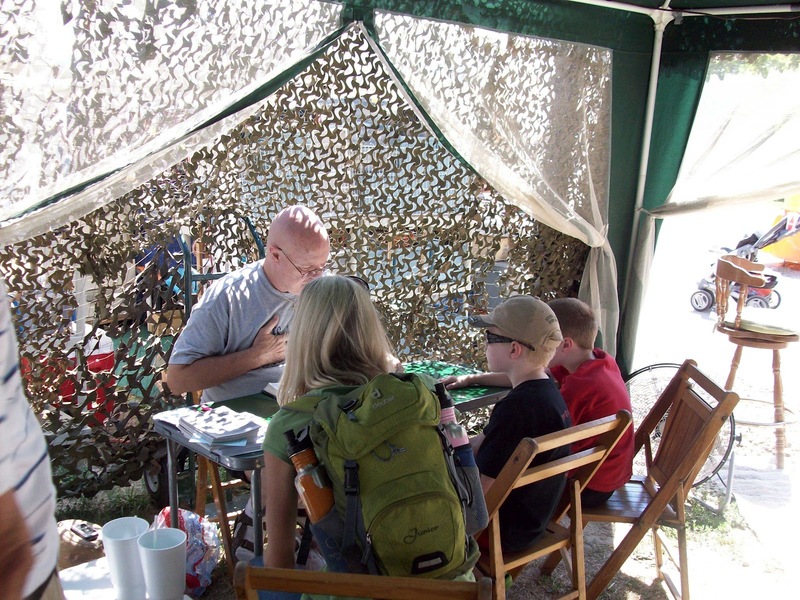 Inside the Box Fair Ministry has now been to over a dozen fairs in multiple states and two countries. The setup is always the same. Two boxes are there with a viewmaster in the top. 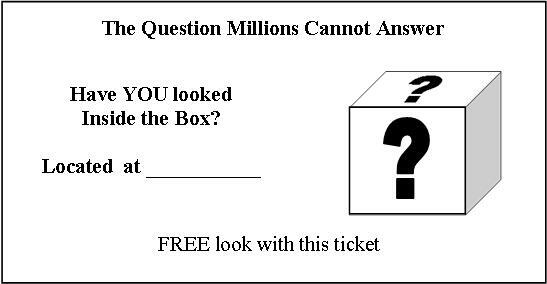 By looking into the first box the passer by sees the question, "If you died today are you 100% sure you will go to heaven?" If they are NOT able to positively answer we invite them to look into the second box which has John 14:6 inside. As of the end of 2011 in just 4 years, God has used this ministry and half a dozen or so churches to bring His salvation to 3765 souls! It is this ministry's vision to continue to expand through the help of the local Bible Believing and preaching church into more fairs throughout the nation and world. People need to know the Gospel, they need to know that Christ died for them. We must tell the world there is a way that they may know for sure they will go to heaven. Will you help us? Will you tell them? If you are interested in evangelizing at a fair in your area, we would love to train you. Please contact us for further information, because the fields are ready for harvest the Lord just needs His servants to reap.